On the third day of the sightseeing blitz, I took a long hike through the city with a number of stops along the way, focused on works of Antoni Gaudí. The first of these was Park Güell. I had already briefly visited Park Güell on a morning run but had not explored it extensively. 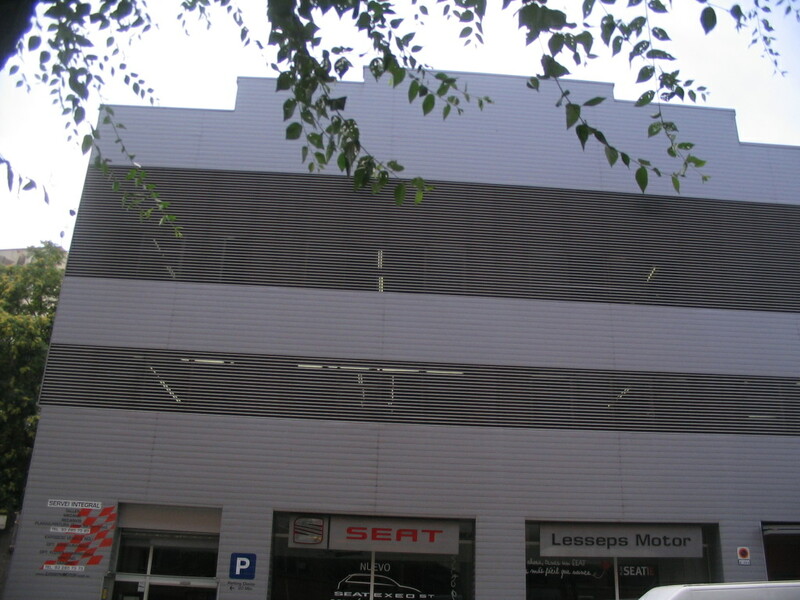 To get there, I rode the Metro to Passeig de Gràcia and thence to Vallcarca. 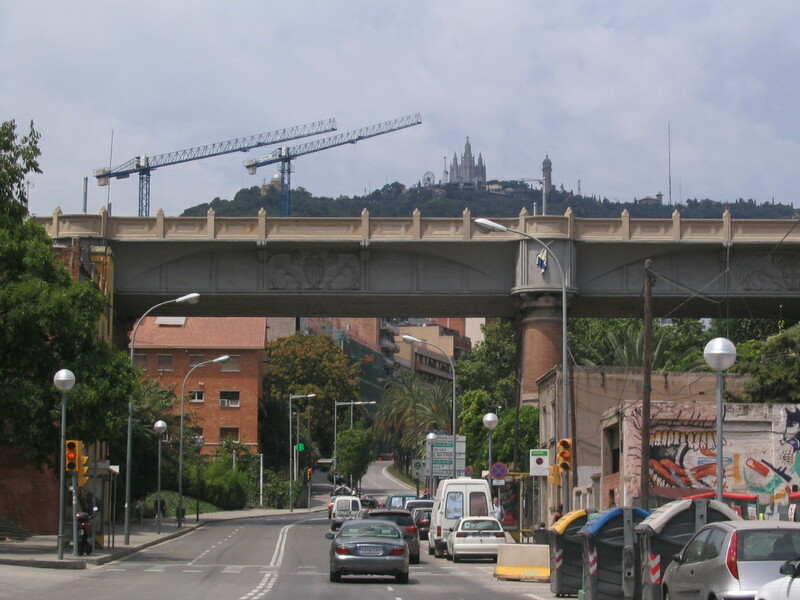 Here, a striking view of Tibidabo up the Av. 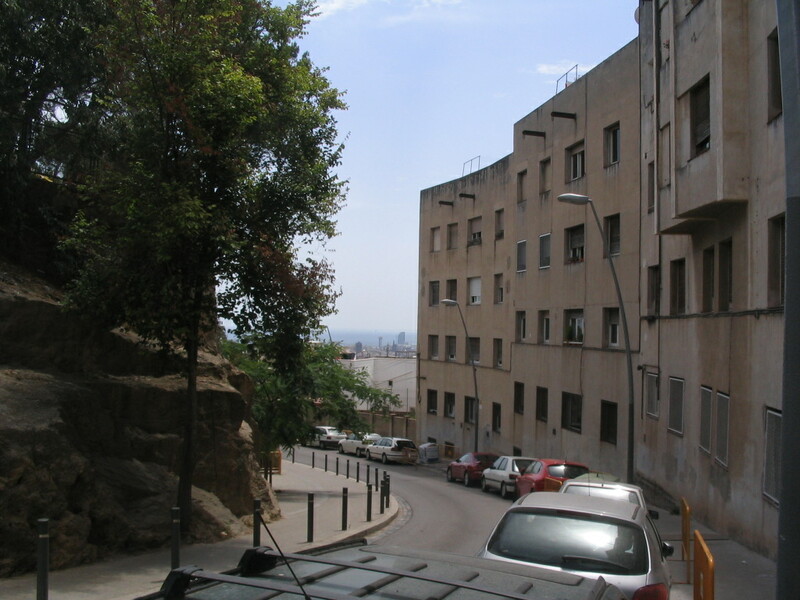 de Vallcarca, with the Carrer Viaducte de Vallcarca crossing overhead. At the corner of Av. 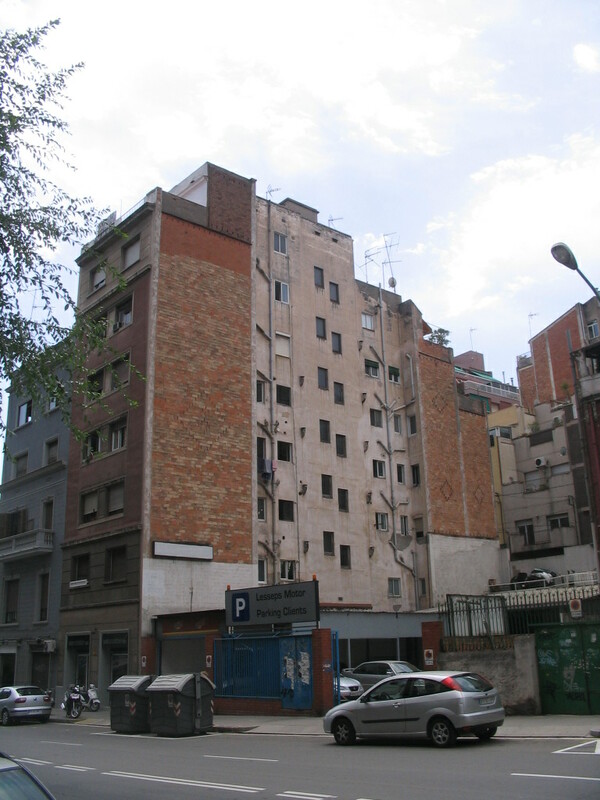 de Vallcarca and Carrer de Cambrils: this is what's known in urban design as a "cheese wedge." 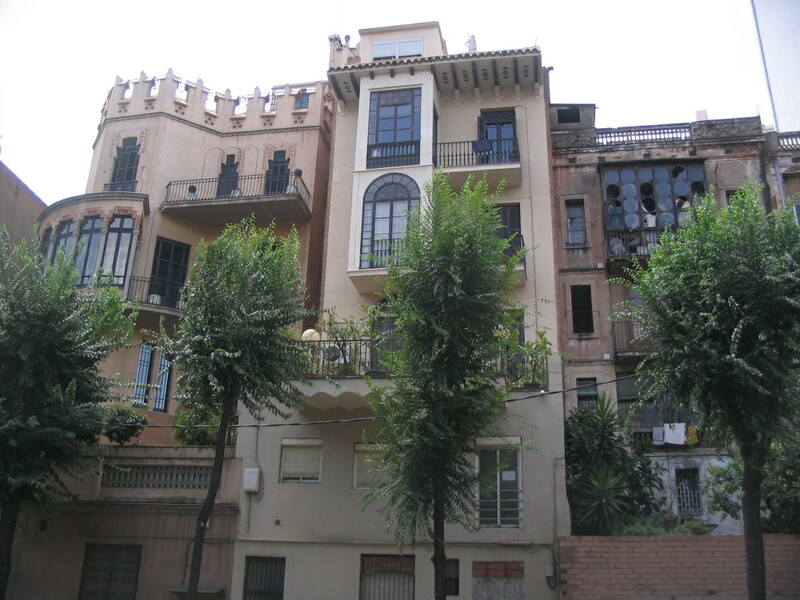 Across the way from the next block down Vallcarca, a nice collection of subtle Moorish-looking façade details, plus a bonus: cantilevered Catalan vaults. 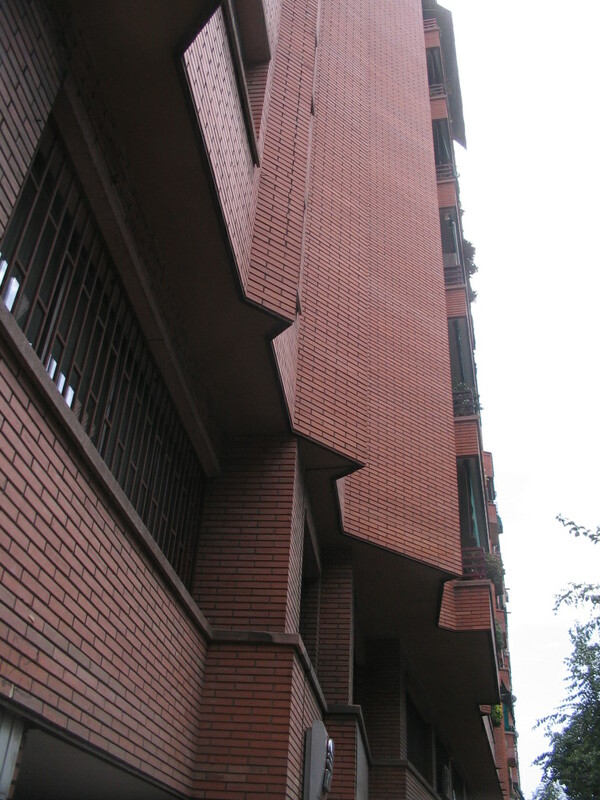 Just down from there and across again: thin-brick diagonals. And across from there. I think horizontality is not adequately emphasized here. More horizontals please. 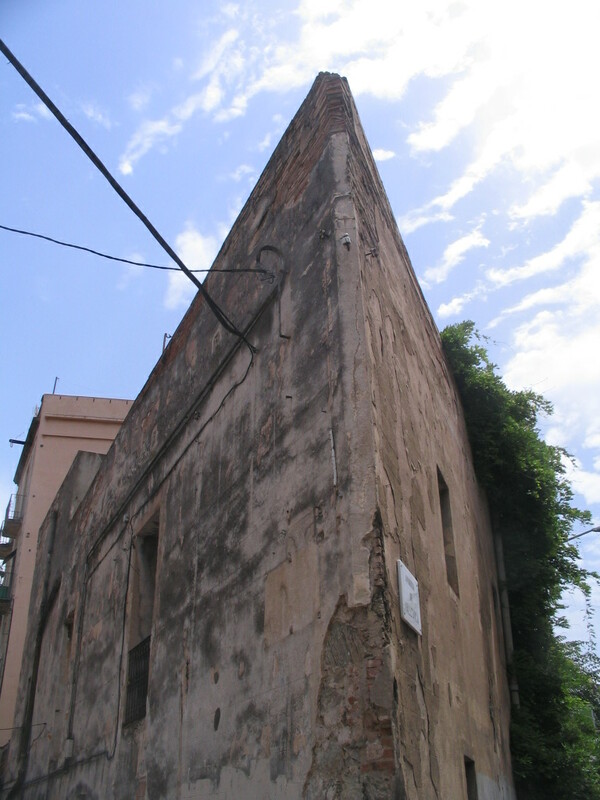 Adjacent to the previous: I assume the middle portion of the wall was originally an internal lightwell. The exteriorized plumbing stacks are a pleasant touch. Talk about expressed systems. 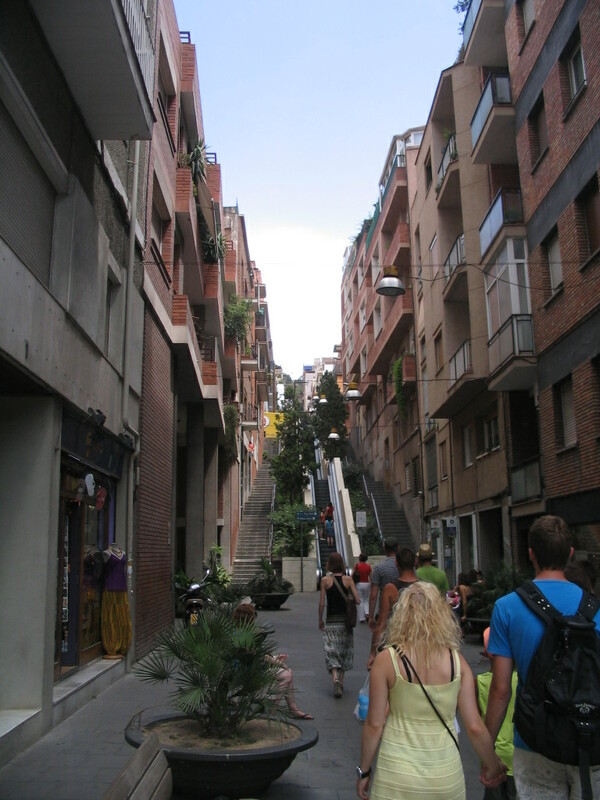 Then I turned left onto Baixada de la Glòria, which is so crazy steep that most of it is escalators. 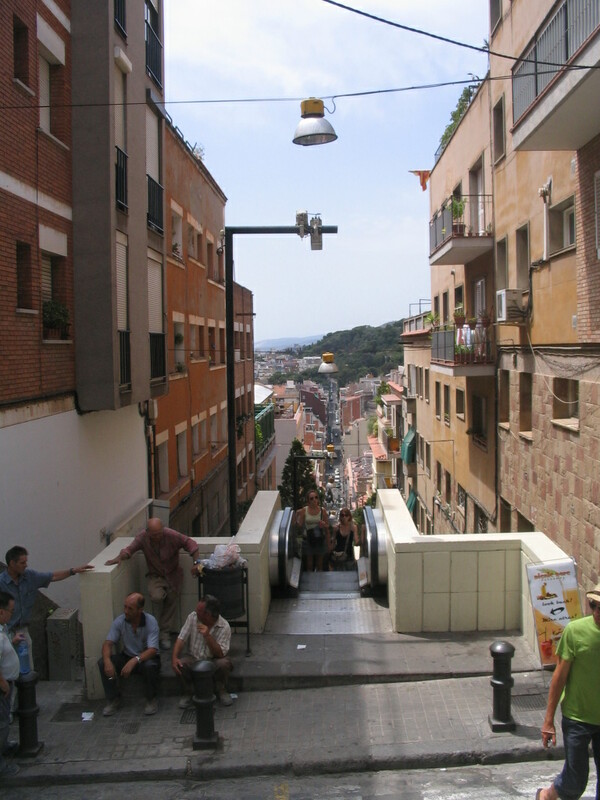 The precipitous view back down the Baixada from Carrer de Sostres. 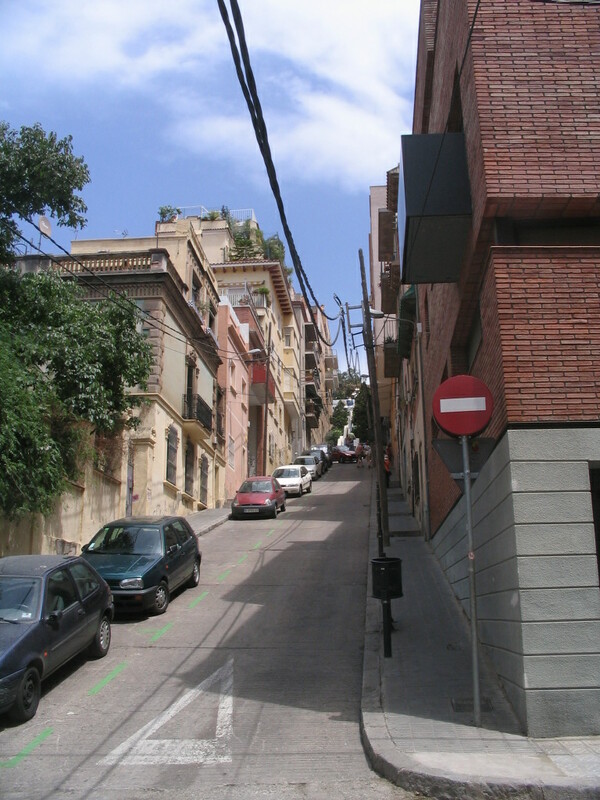 Right at the top of the Baixada is Park Güell itself. The Park's cliffs jut out at left, forcing the Av. Coll del Portell to bend around them here. 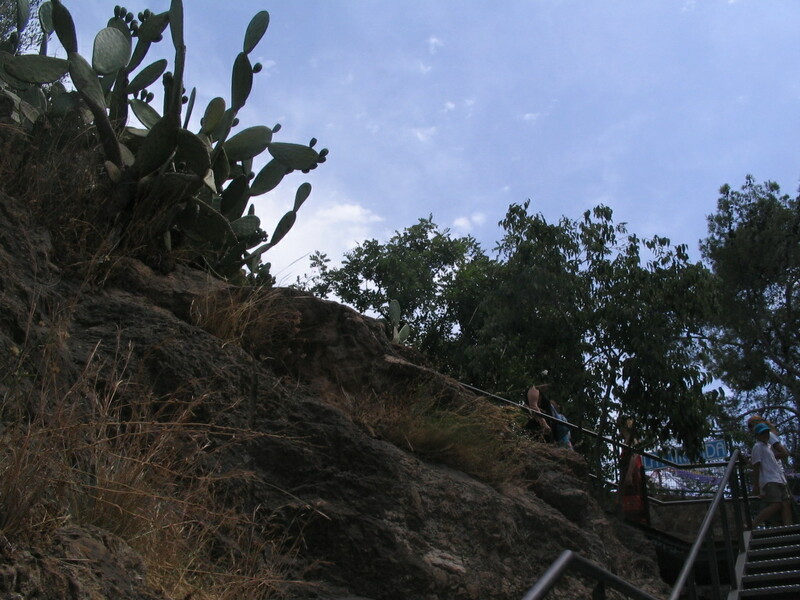 The start of the ascent into the Park. 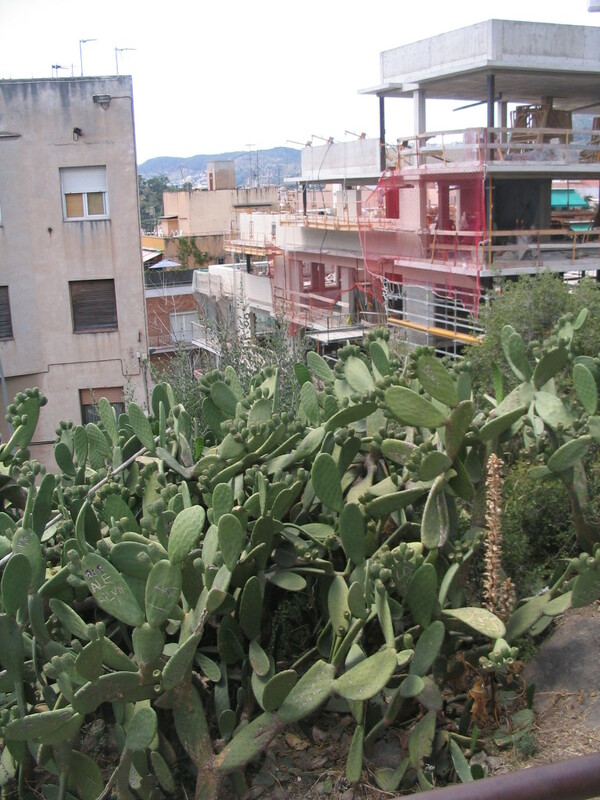 Lots more prickly pearlets in the view back to Baixada de la Glòria.